From all of us at Calvary Women’s Services, have a very Happy Thanksgiving! At Calvary, there is so much to be thankful for. We are thankful for the community of residents, volunteers, donors, board members and partners that supports our mission of offering a safe, caring place for tonight; support, hope and change for tomorrow. We are thankful for these individuals who come together to create a family for women who may be struggling during the holidays. We are thankful for the volunteers who will prepare and serve Thanksgiving dinner in the Good Hope Kitchen, and for organizations like Hogan Lovells, which donated Thanksgiving baskets to women so they can enjoy delicious holiday meals. 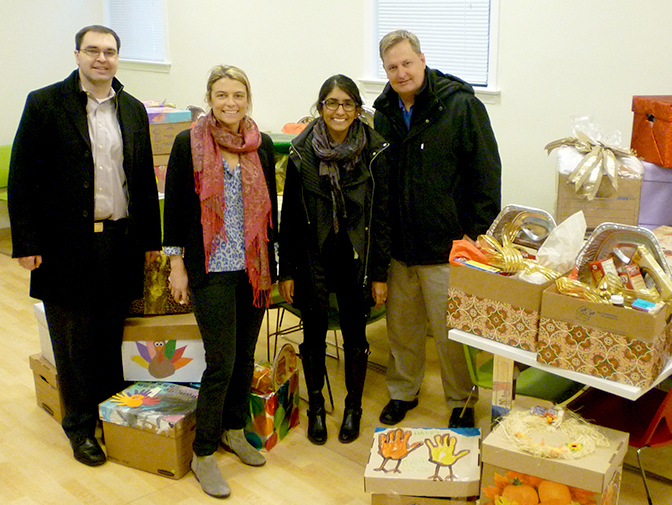 Staff from Hogan Lovells donated baskets full of food for Thanksgiving. How do you give thanks for the good people and things in your life? One way to give thanks is by giving back – that is the purpose behind #GivingTuesday on December 2. This globally recognized event was organized partly as a response to Black Friday and Cyber Monday. Instead of getting gifts, #GivingTuesday is a day for giving back and supporting the causes and organizations that you are passionate about. If you want to give thanks and give back, you can make a donation through Calvary’s #GivingTuesday page any time between now and December 2.